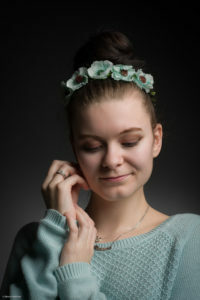 I had a studio shoot with Rianne. She is a model and has her own webpage. Check it out: My Life As Rianne! The basic idea was to shoot some cute images of her. However we did shoot that cuteness in a pretty moody lighting environment to give the images a nice edge. 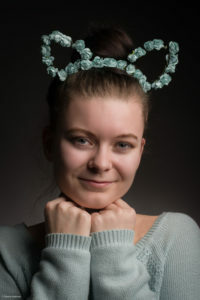 We started with some cat ears made from little flowers. After that we put some flowers in her hair. 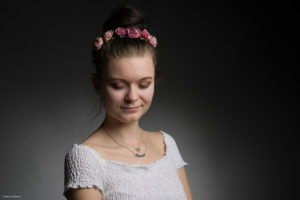 Rianne is very good in doing some dreamy poses as you can see in the images below. 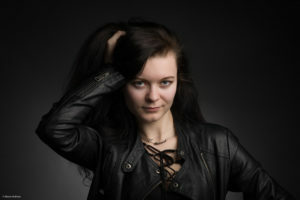 And in the end we just did a few images with her touch leather jacket as well to counterweight all that cuteness. I used a very basic lighting setup for this shoot. Just a small octabox as a main light and a gridded reflector on the background. I didn’t use a fill light in order to create some more shade on her face. Only for the images with the dark leather jacket I added a stripbox as fill to distinguish her dark hair from the jacket a little more. I had a lovely shoot Rianne. Thank you for that great session.